Home / Computers/technology / News / Ever Wondered What A Heartbeat Looks Like In Real-time? At the University of Tokyo, researchers announced a new advancement in wearable technology: A highly flexible electronic skin display that shows your health information, allowing you to monitor vitals at a simple glance. Made from nanomesh, the display is flexible, breathable and stretchable and can stretch up to 45% of its original size. It contains a display of micro-LEDs which read out health information such as heart rate, temperature or blood pressure. 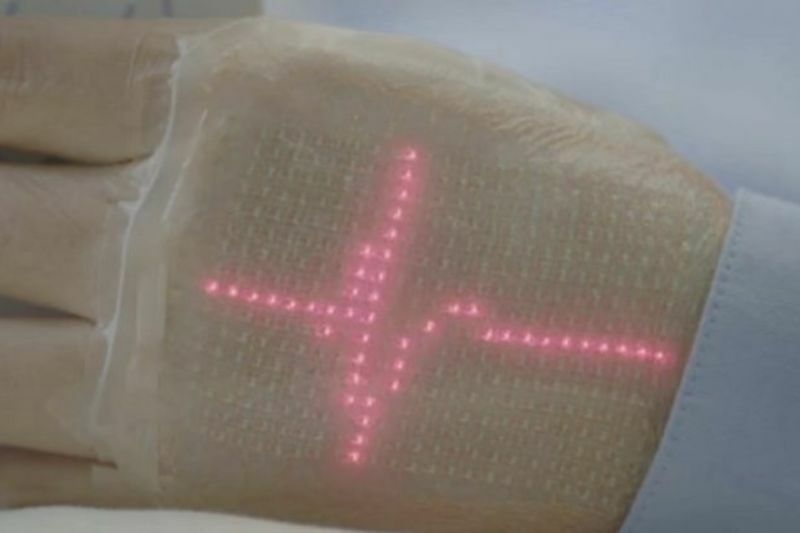 The information updates in real-time, and the skin can be worn for up to a week. It gives the biometric data to the user via a waveform readout, it eliminates the need for a phone or app to process data. It can still be paired with a device or the data can either be sent to cloud storage or it can store the information locally. The research team, led by Professor Takao Someya, have worked on multiple kinds of e-skin sensors over the years. Last year Someya co-authored a paper describing the device's construction and how to make it breathable. If nothing else, this takes this a step closer to the "bodyNET" that Standford University researchers proposed last year – the full-body network of sensors and wearables that could potentially be the endgame for our human/tech interactions. According to the university, the printing company which manufactures the skin hopes to have it ready for market in the next three years. Have You Seen The Latest Samsung Display?